Understanding customers is a critical step to finding more, and that’s the job of the V-Profiler. 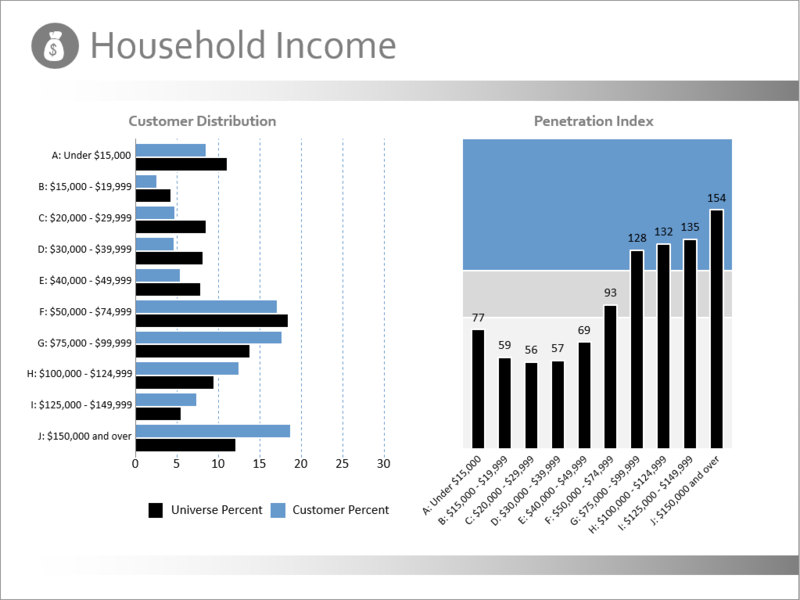 This program was created to analyze a customer database, using more than 20 demographic attributes. 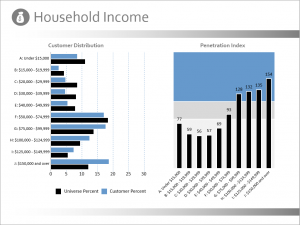 The result is an in-depth report that shows the demographic makeup of a company’s customers. In addition, the analysis shows a penetration index of each demographic attribute, answering questions such as: How well are we doing with women? Or Millennials? Or high income families? 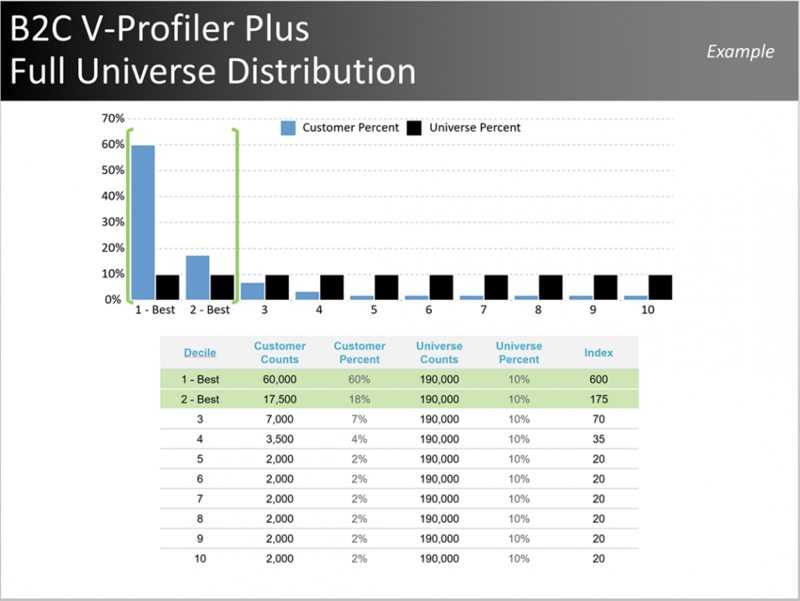 The V-Profiler report is an information-rich view of any database (customers or prospects) that offers a visual, easy-to-understand snapshot of customer demographics or B2B firmagraphics. Reports are completed quickly, offering accurate and in-depth customer profiles to enable fine-tuning of future marketing programs. 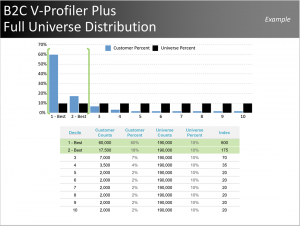 V-Profiler Plus creates a V-Profiler analysis plus a logistic regression scoring algorithm that ranks potential prospects (business or consumer) based on how closely they resemble current customers. Use V-Profiler Plus to identify the high propensity prospects in any market while eliminating prospects unlikely to respond or buy. The V-Profiler Plus scoring algorithm can be appended to your prospect database or to the Virtual DBS business or consumer marketing universe files, offering maximum flexibility and market coverage. The team of modeling experts at Virtual DBS can create custom models and scores, unlimited in scope, based on any unique business need. Custom models can identify the attributes of your customers so you can market to the look-alike records from your prospect lists or a Virtual DBS list of consumers or businesses. Customer segmentation statistically explores the relationships within a customer database to identify and optimize the natural clusters or segments of the groups found within. It tests for all potential interactions using demographics and geography to find naturally occurring clusters in the database. After this process, a custom model can be created that identifies which variables, or combination of variables, have the greatest influence on making someone a customer. This is used to predict the desired outcome (respond, purchase, donate) and ultimately to create unique, identifiable segments of customers which can be used to optimize campaign messaging and response. 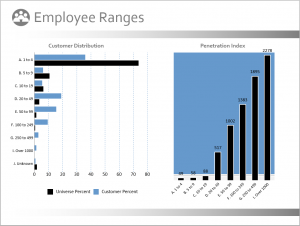 Most segmentation models culminate in a score or set of scores. The score incorporates all of the predictive attributes identified in the model and the relative importance of each in predicting the likelihood of a response, purchase, donation, etc. The unique scoring method can be applied to any database to identify the likelihood of each prospect to take the desired action. In the scoring process, each prospect receives an individual numeric score, making the selection of optimal records for marketing campaigns easy and intuitive.